Her opponent, Sorana Cirstea, immediately climbed over the net to check on Mattek-Sands, who after about 20 minutes was removed from Court 17 on a stretcher and taken to a hospital. The extent of Mattek-Sands’ injury, which came in the third set’s opening game, was not immediately known. But word quickly spread around the grounds, generating concern among players. She’s popular on tour, known for her gregarious personality, loud laugh and original fashion choices, including the stars-and-stripes knee-high socks she wore while teaming with Jack Sock to win a mixed-doubles gold medal for the U.S. at last year’s Rio Olympics. She’s also quite a doubles player, ranked No. 1 right now after teaming with Lucie Safarova of the Czech Republic to win the past three major championships and a total of five. Safarova heard about Mattek-Sands on TV and ran to her court, then stood nearby and wiped away tears as she saw her friend and playing partner in distress. 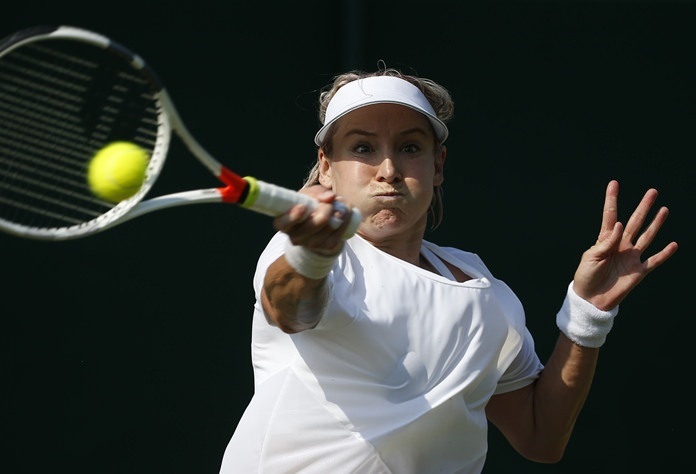 Mattek-Sands — who was born in Minnesota, lived in Wisconsin and now calls Arizona home with her husband Justin — thought about quitting tennis years ago after a series of injuries. There was hip surgery less than a week after her wedding in late 2008, a torn shoulder in 2011, a broken right big toe in 2012. Her ranking dropped outside the top 250 in singles and doubles in 2014, when she missed six months after another hip operation. “I’m just, like, really hurt for her,” Safarova said. There was no indication that the condition of the grass on the court had anything to do with Mattek-Sands’ fall, but playing surfaces around the All England Club were a source of complaints by others Thursday. In particular, the areas near many baselines are brown and worn, with little or no grass in spots — looking the way Wimbledon’s courts usually do by late in Week 2, not as soon as Day 4 — something players said they were told was a result of unusual heat and lack of rain in recent weeks. “The patch near the baseline is eaten up and the dirt underneath is like ice. Look around, people are going down left and right,” said 46th-ranked Alison Riske of the U.S., whose 2-6, 6-4, 6-4 victory over 12th-seeded Kristina Mladenovic of France at Court 18 was one of a handful of upsets in the women’s draw, including No. 3 Karolina Pliskova’s three-set loss to Magdalena Rybarikova. Both she and Mladenovic complained to the chair umpire before play started, and again after each took a tumble in the first two games. Mladenovic said she twisted her ankle during the warmup period and said she’ll have an MRI on her right knee, which turned awkwardly in the second game.